To build our animatronic figures, we will be using servo motors as actuators. The term “servo motor” refers to electric motors which can be controlled in some fashion. 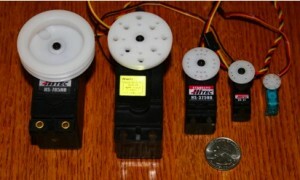 We will be using a specific class of servo motor made for use in radio-controlled model planes, boats and cars. These are usually called “R/C servos”, “hobby sevos” or just “servos” for short. The piece which rotates is replaceable, and is called a “servo horn”. Servos typically come with a selection of different horns, as well as some basic mounting hardware. In most modeling applications, you attach to the servo horn via rods through the holes. In robotic and animatronic applications, we generally attach metal pieces to the horns via screws. The horn itself fits on to a small gear on the output shaft. Sadly, different manufacturers use different gears, so horn sets are generally not interchangeable across different brands. 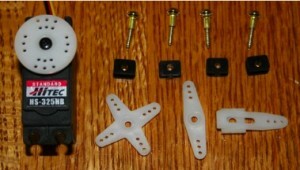 The rubber pieces provide some protection from shock – a real problem when crashing a model airplane. We will not be using them. In addition to their size and weight specifications, servos are typically rated by their torque and speed. Torque is a measure of how much rotary force the servo can deliver, typically in ounce inches (oz in) or kilogram centimeters (kg cm). A servo which is rated for a torque of 48 oz-in can hold up 3 lbs. (48 oz. = 3 lbs.) one inch away from the shaft. Three inches away, it could only lift 1 lb. Note that it can hold it, but can’t move it. If you want to move a 1 lb. weight located three inches from the shaft, you will need significantly more torque than 48 oz-in. Servo speed is specified as the time in seconds to turn 60 degrees (1/6 of a turn). Typical servos take about two tenths of a second to go 60 degrees. Most servos will turn a maximum of about 180 degrees. To go the full range will take at least three times as long, or about 0.6 seconds. There are some specialty servos which are designed to do multiple turns. Sail winch servos have a pulley wheel rather than a servo horn, and are designed to real in a cord over about three turns. Servos have three wires – ground (or negative), power (or positive), and control. These are typically colored black or brown, red, and white or yellow respectively. These go to a 3-pin connector. Although different manufacturers use slightly different connectors, almost all of them will work with standard servo controller boards. (Airtronics brand servos have power and ground reversed and will need to be modified before use.) The connectors work because the boards don’t have any housing around the pins. The down side is that this means you can easily plug in the servos backwards or shifted by a pin, which can damage them and the controller. Make certain you have all your servos plugged in the right way before applying power! Because servos have a limited range of movement, you want to make sure that the servo is in the right position when you mount it in your setup. You could hook up your servos to a controller, and run VSA to find the center. But a better solution is to use a dedicated servo tester. 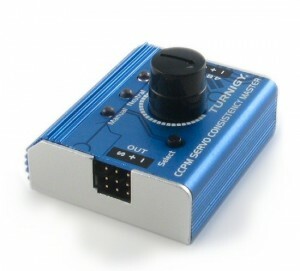 I like the Turnigy Servo Tester, which is available for under $10. It allows you to quickly set the servo to its center position. It also lets you manually control the servo with the knob (typically, over a +/-45 degree range – using the controller and VSA, you can get more range), or even set it to automatically sweep back and forth. The one negative of this device is that you need an external power source. I recommend getting a 4-AA cell pack with the appropriate connector. Because there is no power switch, you will need to disconnect this from the tester to shut it off. Hobby King – Particularly good for inexpensive, lesser known servos. They have multiple warehouses, and often the price and shipping times will be wildly different depending on where it is coming from. Tower Hobbies – A general hobby store. Servo City – A less full selection, but they also feature some rather unique servos. Check out the Robotzone and linear servo lines. Not cheap, but you can get some seriously powerful devices. Lots of great accessories! Lynxmotion – A fairly limited, but well chosen, selection. Be sure to check out their servo erector set components! Servos come in many different sizes, but there is actually something of a standard for the “standard size” servo. They have the mounting holes in the same place. This is much less true for the other sizes. Standard size servos are by far the most common, and it’s easy to find pre-made brackets for these. Your life will be easier if you can build most of your stuff using standard size servos. The also seem to be a pretty good trade-off in terms of size and strength for use in animating hand puppets. Smaller servos typically have a lot less torque, and the small internal gears are much more easily damaged. (A good rule of thumb is to avoid turning a servo shaft by hand!) Many people like the HXT900 which is small, fast and inexpensive. These are too small for gross puppet movements, but perfect for low load applications, like raising an eyebrow, or rotating an eye. In choosing servos, you will see that there are many other features to select among than just size, speed and torque. Metal gear servos tend to hold up longer, particularly in applications where the servo is subject to shock (e.g. an arm running into the end of travel). However, they do tend to be noisier. Ball bearing servos tend to operate more smoothly, and can better deal with side loads (pushing side ways on the shaft). Digital servos have much more power and can be faster, but they also draw a lot more current, and sometimes they have very audible whining. Cheap servos often have deadband problems – they don’t change position until you command a bigger move. They can appear jerky, and often have poor positioning repeatability.